The 2019 USHOFF Ream’s Scholarship Application and cover letter were NOT mailed to the schools this year. Each high school counseling office should have received an email from their district directors by March 4. Please contact your school counselor to check about getting the application. Each school can select ONE boy and ONE girl. All applications MUST be postmarked no later than April 1, 2019. If any school did NOT receive an application, the counselor can contact Scholarship Chair Richard Valdez at 435.830.3094 and he will email the material to that school. Shawn will attend Brigham Young University after his church mission to Paris, France. He played basketball and football, helping Orem High School win the state football title this year. He was Student Body Vice-President and also earned his Eagle Scout. He did community service projects during high school and was a member of the HOPE Squad. He was selected to attend Camp ‘U’, a leadership program. He maintained a 3.83 GPA and he was a member of the Audition Choir. He sang the National Anthem at a Jazz game. 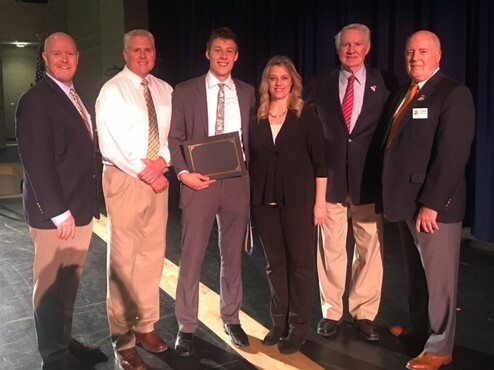 USHOFF past president and board member Joel Gardner (second from right) and board member Terry Shellenberger (right) presented Shawn’s scholarship. Principal Michael Browning was present for the award (far left). Shawn is the son of Clark and Sheri Anderson. 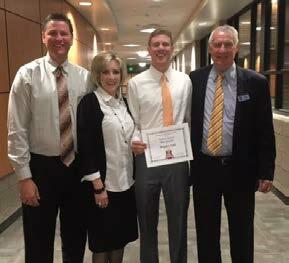 Jace plans to study Pre-med at Southern Utah University after serving a church mission in Botswana, Africa. 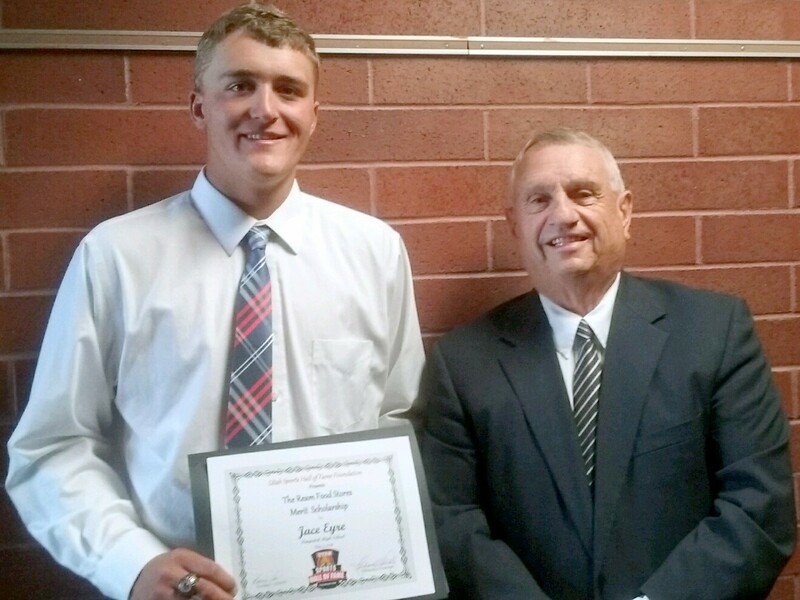 At Panguitch High, Jace led his basketball team to two state titles and was named MVP this past year. Jace made All-State in basketball and baseball and competed in track, finishing second in the shot put and 6th in the discuss this year. He also lettered in golf. As a leader, Jace served as Student Body vice-president, class VP in ninth grade and was selected to attend Camp ‘U’. He served as Captain of the baseball and basketball teams and earned his Eagle Scout. Community Service kept him busy and he was involved with FCCLA and FBLA. USHOFF board member and past president Evan Excell presented Jace with his award. Jace is the son of Brady and Wendy Eyre. Valerie plans to attend Snow college, studying Graphic Design and working for a career in Advertising and Marketing. She will serve as an Ambassador while at Snow College. 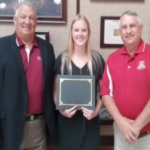 Earning a 3.98 GPA, Valerie rece4ived Adademic All-State in volleyball and basketball. She was named All-State in volleyball twice. She also was a four-year starter, letter winner and team captain in both sports. Valerie played in the Jr. Olympics outdoor sand volleyball in California. She was a Student body officer in 9th, 10th and 12th grade. She made a Humanitarian trip to Paraguay, Brazil and Argentina, helping build an elementary school. 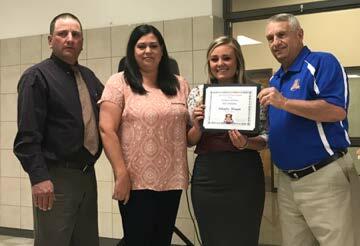 USHOFF board member and scholarship chair Richard Valdez and board member Lamar Hirschi presented Valerie her scholarship. Valerie is the daughter of Shon and Charlene Harker. Addison will be taking general education classes at Snow College and moving on to Utah State University to go into Natural Resources as a career. 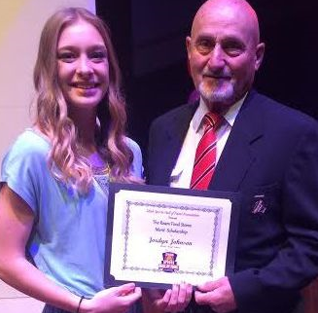 Playing soccer and softball, Addison was named All-State and Academic All-State in both sports. She was a captain for both teams as well. She was on the yearbook staff and a member of FACS. She maintained a 3.98 GPA for four years. She also passed the certification skills tests for Floriculture and Animal Science I. For community service, Addison helped plant trees in her community and took young kids to dance at a local nursing home at Christmastime. 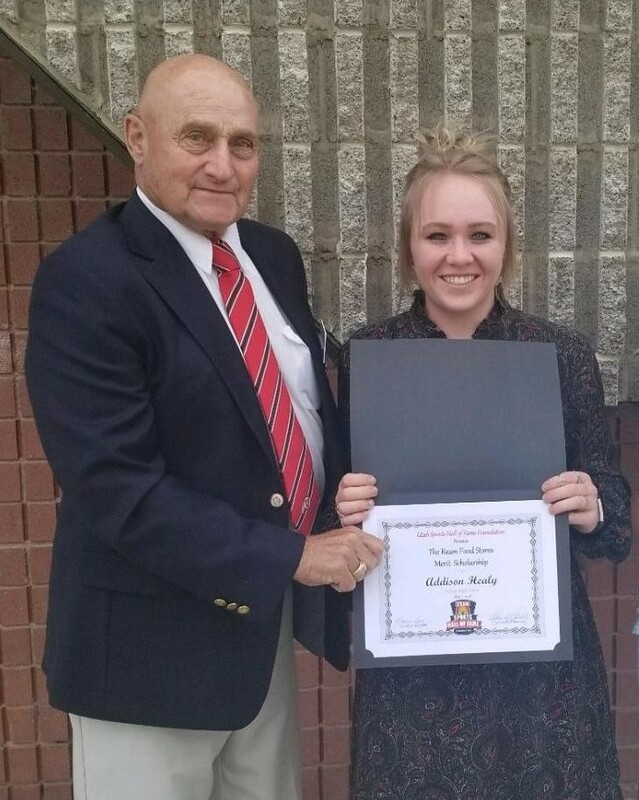 USHOFF board members Kent Draayer presented Addison with her scholarship award. Addison is the daughter of Quinn and Kacie Healy. Lindsey plans to attend Brigham Young University this fall. but is undecided on her major. She earned a 4.0 GPA and a 30 on her ACT. She was a four-year varsity starter and letter winner in track and field. Lindsey placed fifth in state in ninth and tenth grade in the 4 X 100 relay. Last year, she finished second in state in the 100 meter hurdles and was crowned state champion this spring and has the 5A state record at 14.30. She was a team captain this year and was named Academic All-State. Away from track, Lindsey was a peer tutor and a member of the Link Crew. In HOSA, she won a silver and bronze medal at statte competition and became CPR certified this year. USHOFF board member Terry Shellenberger presented Lindsey her award. Lindsey is the daughter of Michael and Laura Middleton. Hannah will be attending Utah State University in the fall and plans to pursue a career in Elementary Education. She maintained a 4.0 GPA and scored a 26 on the ACT. Hannah was very involved in all types of dance. 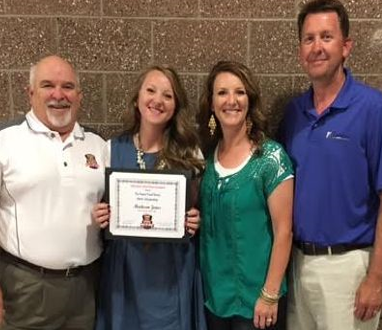 She was a four-year member of the school’s drill team and was named Academic All-State this year. She was awarded a letter for three years. She was also a member of the Emotion in Motion competition dance team. She was a state winner in 4-H Dance and she played recreational soccer. In leadership, she was drill team president, senior class officer, Winter Ball chairman and Miss Nephi Royalty First and Second Attendant. 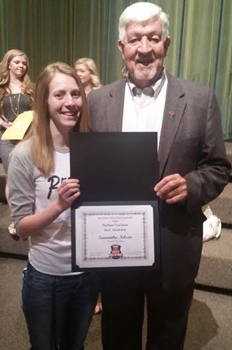 USHOFF board member Steve Gardner presented Hannah with her certificate. Hannah is the daughter of Doug and Fran Petersen. Mckenzie will attend Snow College this fall and plans to go into either Physical Therapy or Nursing. She was involved in cross country and track and field for three years, lettering each year. She served as cross country captain this year. 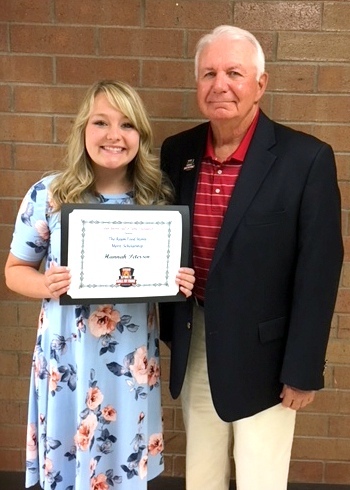 Mckenzie maintained a 3.921 GPA while taking A.P., Honors, CE and IB classes. She earned her Certified Nursing Assistant certificate, was a two-year member of the National Honor Society and was a school ambassador. She worked at the library and did babysitting for free. Because she was good with a camera, she volunteered to take pictures for boys and their Eagle Scout projects. 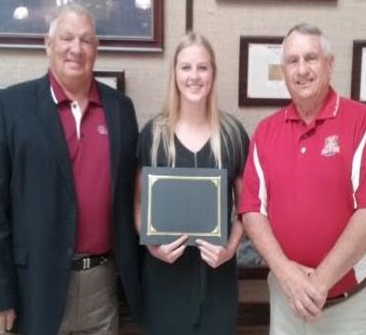 USHOFF board members Kent Draayer and Ken Gardner presented Mckenzie her certificate. Gardner graduated from Clearfield High in 1967. Mckenzie is the daughter of Andrew and Jennifer Qualls. Koebe will attend Utah State University after a mission to Scottsdale, Arizone. He is planning for a career in International Business. He maintained a 3.89 GPA and scored a 29 on the ACT. He was a four-year player in football, basketball and baseball, earning eight letters. In football, he was team captain and was named All-Region twice and All-State as a senior. He was Valley Defensive Player of the Year. In basketball, he was All-Valley as a senior. He made All-Region in baseball this year. He coached youth football and taught basketball skills to special needs students. He was a member of the National Honor Society for three years and was a member of ‘Eyes Up, Do the Work’, encouraging students to help stop bullying. 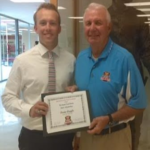 USHOFF board member Dave Kragthorpe presented Koebe with his scholarship award. Koebe is the son of Kim Nield and matt Wilson. Tiffanee will attend Utah State in the fall to pursue a career in the medical field. She was a 4-year member of track and soccer and a 3-year member of the drill team. She was named All-State in soccer and qualified for state in track. Tiffanee had a 3.99 GPA, was a class officer for three years and served as Student Body Secretary this year. She was captain of the track and soccer teams and was involved in many clubs and organizations. 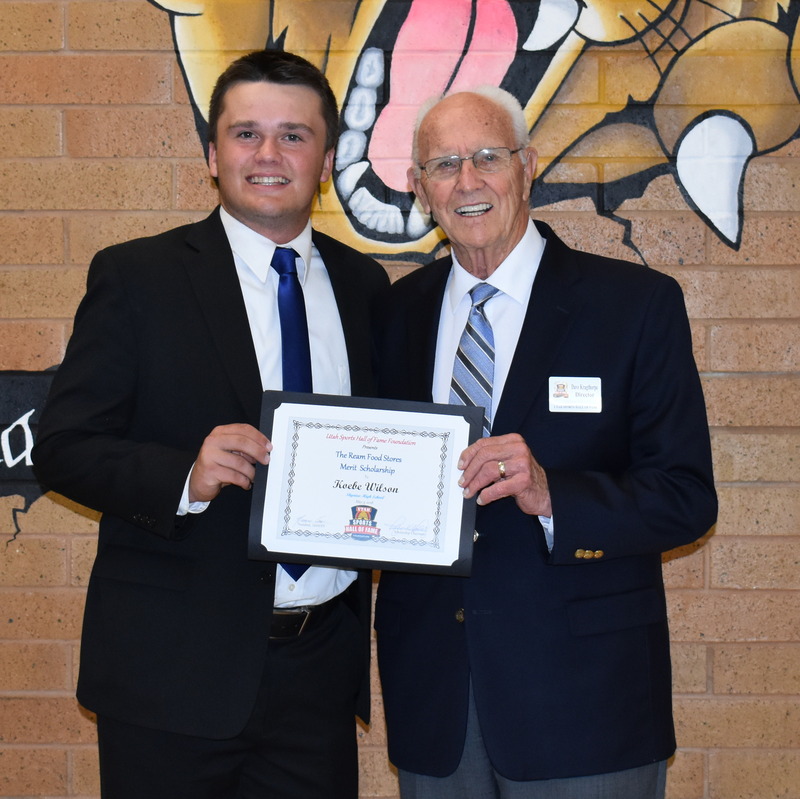 Presenting her scholarship was USHOFF scholarship chair Richard Valdez, a Tooele High grad. She is the daughter of Keith and Debbie Bird. Braydon plans to attend Utah Valley University after returning from a church mission to England/Manchester. Playing basketball for three years, he was the team captain his senior year. He was involved in school organizations and earned a 3.86 GPA. Braydon was fortunate to travel to Mali, Africa this year. While there, he worked in a dental clinic, an orphanage and helped make bricks for a school expansion in Mali. He also earned his Eagle Scout. USHOFF President Joel Gardner presented Braydon with his scholarship. He is the son of Rob and Sonya Cuff. State in football and track. 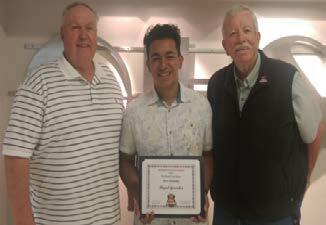 He was named the Male Athlete of the Year for Dixie High. 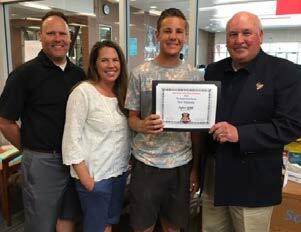 He was Student Body Vice-President this year and earned his Eagle Scout USHOFF board members Evan Excell and Jack Bishop presented him with his scholarship. Malakai is the son of Salesi and Kim Fakahua. in school and community volunteer work and earned His Eagle Scout award. 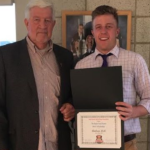 USHOFF board member Lamar Hirschi presented Tyler with his scholarship. He is the son of Ron and Heather Gibb. Miguel will attend Weber State in two years following a church mission. He is interested in engineering/architecture. He played football and tennis for four years . He was a regional Sterling Scholar in Skills & Technology and earned a Pathway certificate in Engineering Technology. Miguel had a 3.98 GPA. He did a lot of community service with local organizations & he earned his Eagle Scout in 9th grade. 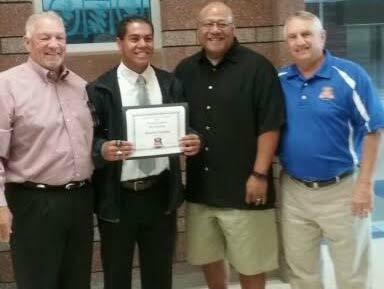 USHOFF board members Dave Nordquist and Phil Russell, who were both athletic directors at Ogden High, presented Miguel with his scholarship. He is the son of Miguel and Francisca Gonzalez. Brooke will be attending Utah State University this fall with plans to earn a degree in Elementary Education. She played varsity basketball for four years, making All-Region and All-State as a senior and served as team captain. Her GPA was 3.97. She was a Student Body officer (artist) and member of HOPE Squad this year. She was also on the Principal’s Council. Brooke was involved in clubs and organizations and was a certified lifeguard. 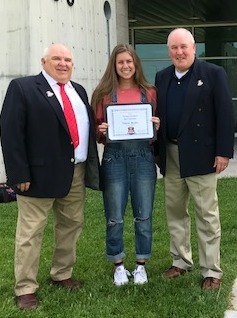 She received her Scholarship by USHOFF president Joel Gardner and board member Terry Shellenberger. She is the daughter of Mark and Jill Ingles. Mikaylee will attend Utah State this fall, studying accounting. She earned a 3.99 GPA. She lettered 4 years in volleyball, basketball & track; served as captain for all three sports. She won the state shot put title last year and placed 2nd this year. 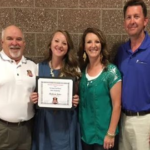 She placed twice in the javelin at state, named Academic All-State in track and was Piute’s Female Athlete of the Year twice. Mikaylee was Student Body Secretary and a leader in other organizations & clubs. 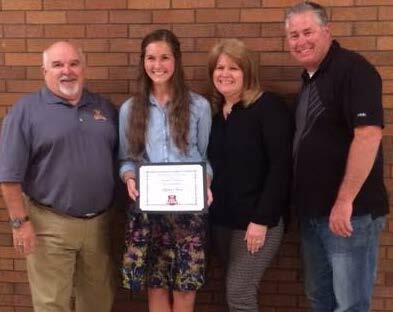 She attended Girls’ State and the Hugh O’Brian Youth Leadership conference. 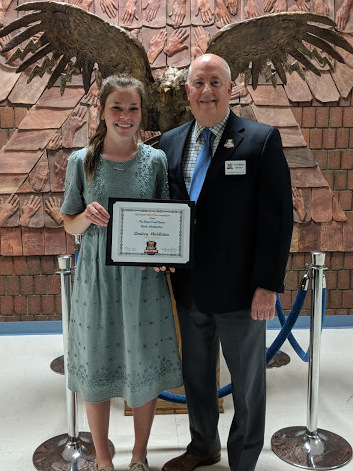 USHOFF board member Evan Excell presented Mikaylee her scholarship. She is the daughter of McKay and Gwen Morgan. on the swim team and track team her senior year. As a sophomore, she performed with the school’s drill team. This year as Student Body Service Chair, she helped organize various school activities to assist them to be successful. She was a two-year member of the HOPE Squad and also served with the Health Occupations Students of America. 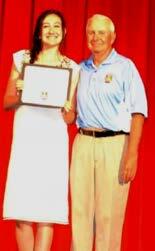 USHOFF board member Steve Gardner presented Tiana with her scholarship. She is the daughter of Reyn Spencer. Samantha will be attending Weber State University and working for a degree in Chemical Engineering. She was involved in basketball and cross country for four years, earning Academic All-State in each. She also ran track. 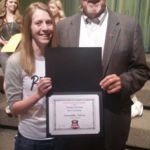 She was very active in community service and was Clearfield’s Dare 2 Lead rep as a sophomore. She also belonged to numerous school clubs. She maintained a 4.00 GPA for four years. 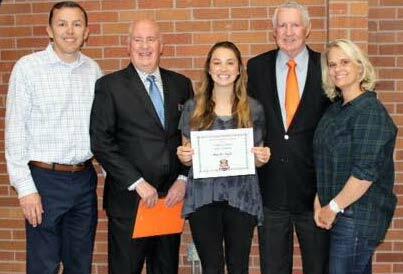 Presenting her scholarship was BOD Kenny Gardner, a Clearfield High graduate himself. She is the daughter of Daniel and Dianne Nelson. Devin will be serving a church mission for the next two years and will return to attend Utah State University. Devin played baseball & foot-ball, earning Academic All-State in each, along with All-Region in both. He was All-State in baseball and helped his team capture the state title in 2015. He maintained a 4.00 GPA during high school. Presenting his scholarship was BOD Steve Gardner. Devin is the son of Brian and Melissa Argyle. Jennifer will attend BYU in the fall, studying for an exercise science career. She played soccer & track, earning Academic All-State & All-State honors in soccer. She was active with many community service activities and attended a Leadership Academy as a senior. She earned a 3.98 GPA during high school. 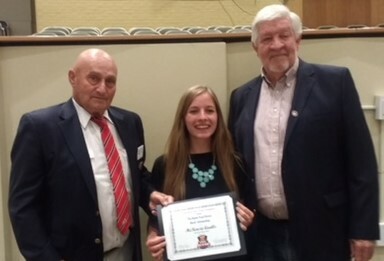 BOD’s Jack Bishop & Evan Excell, (past USHOFF president), awarded Jennifer her scholarship certificate. She is the daughter of Charles and Cynthia Stewart. for 4 years. She was busy with community service & clubs during high school. Scholarship chair & BOD member Richard Valdez awarded Madison her scholarship certificate. She maintained a 3.89 GPA in high school. She is the daughter of Ryon and Tracy Jones. Jordyn will be heading to Weber State University this fall. She was involved in swimming, basketball, soccer & track & field during high school, lettering in all four sports. She helped lead her soccer team to a second place state finish this year. Like the others, she was very involved in community service and school clubs and activities. She maintained a 3.71 GPA during high school. BOD Kent Draayer enjoyed presenting Jordyn with her scholarship certificate. Jordyn is the daughter of Jeff and Lisa Johnson. Andrew will attend the University of Utah this fall. He was busy with sports, playing football, baseball and basketball all four years. He was All-Region & All-State for football & baseball. Andrew represented JHS at the Dare 2 Lead conference. He was kept busy with community service projects. He maintained a 3.99 GPA. 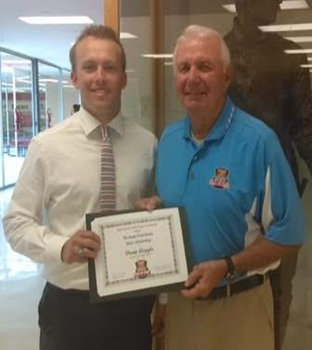 BOD Kenny Gardner presented Andrew with his scholarship certificate. He is the son of Andy & Sharon Lisk.